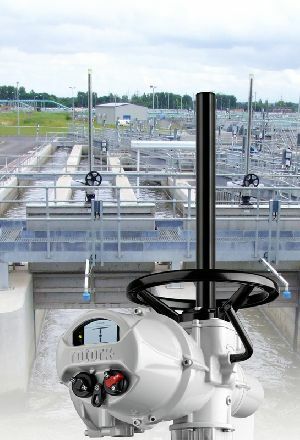 Rotork has introduced a new model in its IQ range of non-intrusive intelligent electric actuators with an optimised combination of valve stem diameter acceptance and torque output to facilitate economical automation of valves and penstocks typically found in the water and effluent treatment industries. The new IQ19 actuator combines a stem acceptance of up to 51mm (2 inches) diameter with torque output up to 135 Nm (100 lbf.ft) and output speeds up to 72 rpm @ 50Hz (86 rpm @ 60Hz). The combination meets the operating requirements of large numbers of penstocks, sluice gates and gate valves. The actuator incorporates the full range of advanced reliability, functionality and asset management features, including an unrivalled range of data logging capabilities, for which the Rotork IQ marque is well known. An information-rich backlit display is the focus of attention for non-intrusive wireless commissioning, communication and multi-functional indication, including user-friendly multi-lingual menus for setting-up and configuration. Local position indication, valve and actuator status, asset management and diagnostic operating information is available to download or viewed directly at the actuator. Diagnostic graphics present a window into the plant, showing the valve torque, usage profiles and service logs, facilitating real-time analysis directly at the actuator and in the control room. Preventative valve maintenance requirements can be identified, eliminating unplanned interruptions to the plant or over-cautious planned maintenance outages. Reliability is optimised by the IQ double-sealed IP66/IP68 watertight and temporarily submersible enclosure, which permanently protects internal electrics from the ambient environment, even during site wiring with the terminal housing cover removed. On the actuator’s compact and robust enclosure, local Open/Close and Local/Stop/Remote selectors are coupled magnetically to internal switches without penetrating the actuator body, further enhancing non-intrusive environmental protection. Emergency handwheel operation with motor preference is provided as standard. Suitable for all industry standard three phase power supplies, IQ19 actuators offer network connectivity with Foundation Fieldbus®, Profibus®, HART® and DeviceNet® open systems, as well as Rotork's own dedicated Pakscan wired or wireless systems. Find out more about the Rotork IQ Multi-turn actuator.